Originally built in 1996 for the defunct Delta Queen Steamboat Company, the 436-passenger American Queen sat dormant between 2008 and 2012, after its owner went bust. But you just can't keep the world's largest steamboat down, particularly since this classic form of transportation on the Mighty Mississippi and its tributaries is seeing a continual rise in popularity. Before relaunching in April 2012, American Queen received a $6.5 million spruce-up to make the Victorian decor -- chandeliers, upholstery, polished wood -- pop. Cabins got new bedding and flat-screen TVs, and a top-deck bar/snack venue (River Grill) was added. Six decks swathed in swirly white gingerbread trim received a fresh coat of paint. The result? The steamboat is delightful and feels much more like a small and historic boutique hotel than a riverboat. The upgrades continue on an annual basis when the ship’s laid up for six weeks or so during the height of winter; changes are made to public rooms, staterooms, and outdoor venues. These days, there's not much that can obscure the ship's status as a true American original that celebrates the nation's river history, lore, traditions, music and food. Whether it's tying up in a little town like Madison, Indiana, navigating a river lock, or docking in New Orleans, it makes quite an impression. And where else in the States can you watch a boat lower its ornate black funnels so it can go under a bridge? River cruisers will note that prices for this boat are higher than they are for mainstream ocean cruises. Keep in mind that rates on American Queen include a pre-cruise hotel stay; transfer to the boat; soft drinks, coffee and tea all day; beer and wine with dinner; a complimentary set of shore excursions; and use of bicycles during port calls. The line also pays American wages and offers benefits such as health insurance and 401K participation to its crew. 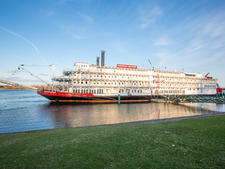 American Queen cruises the upper and lower Mississippi, as well as the Ohio and Tennessee rivers on five- to 14-night theme cruises. Cruises depart from New Orleans, Memphis, St. Louis, St. Paul, Louisville, Nashville and Cincinnati. American Queen passengers tend to be mature, and many have already experienced Mississippi River cruising in the past, as well as ocean cruises. Add in the fact that the boat is more lace-and-doily than neon-and-glitter and not geared in any way toward families, and its older demographic becomes clear. This is a particularly good cruise option for passengers with disabilities as, unlike those on many European riverboats, elevators go to all key decks. 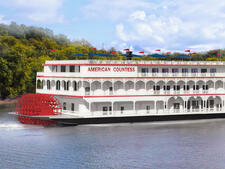 Having said that, younger, more active travelers will find a lot to like about American Queen. It's a great option for a relaxing vacation. While Americans are the predominant audience, the cruise line is expanding its outreach to appeal to English-speaking travelers from Europe, the U.K., Australia and New Zealand. Cruise Critic’s professional photographers and our extraordinary community members have taken 800 pictures of American Queen. When you visit our photo galleries, you can be assured that what you see is what you get. Casual, comfortable attire is encouraged both onboard and ashore. Shorts and T-shirts are discouraged during dinner in the J.M. White Dining Room, and passengers generally comply. Many exhibit a laidback elegance, with casual dresses and khakis prevalent in the evening. Comfortable walking shoes are a must for time off the boat and for merely strolling around the decks. At the captain's welcome and farewell receptions in the Mark Twain Gallery, blazers with collared shirts and nice dresses are common. Tips are not included in the cruise fare; gratuities of $16.50 per person, per day, are added daily into onboard accounts. In addition, a 15 percent service charge is automatically added to all alcoholic drinks purchased onboard. Passengers are encouraged to tip guides on the Premium Choice Tours, but that is left to their discretion. 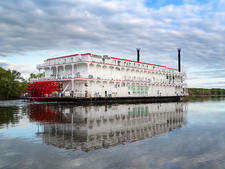 The third paddlewheeler plying the Mississippi for American Queen Steamboat Company, American Countess offers upscale cruising in America's heartland.